One of the only remaining screenshots of the game. 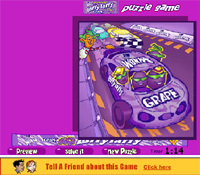 LAFFY TAFFY Puzzle Game was an early 2000's video game that was available on the official Wonka website located at wonka.com . It was a 2D browser drag and drop jigsaw puzzle game which could be played with Adobe Shockwave. It was most likely developed by Left Brain Games because they made a number of similar games for the Wonka website at the time, and was one of many games by this developer that used to exist on said website before all their webgames were removed from it sometime after 2007. Web developers were able to embed the game on their own site - allowing the game to be played on sites other than the official Wonka website - because of a button underneath the game, which provided the HTML code to do so. However, in reality, only the game's loader (loading screen) would be copied to the other site, while the actual game content was always loaded from the official Wonka website. For this reason, when the game was eventually deleted from the official Wonka website, none of the alternative sites the game was also embedded on worked either. Primary Games, Fetchfido and FreeGameZone had the game on their websites, but again it was only the loader (loading screen) which, presently, no longer works because it attempts to load the game content from the Wonka website where it was removed. After the deletion of the webgames from the Wonka website, many of the Wonka webgames were made available on the developer's, Left Brain Games, website instead and, as such, are still playable - but Laffy Taffy Puzzle Game was excluded from the developer's website. FreeGameZone supposedly offered a downloadable version of the game, but this wasn't a proper Projector (that is to say, it wasn't the full game) - rather, this was just the loader (loading screen) embedded onto an HTML page and packaged in a compressed zipped file. This still would have required an internet connection to fetch the real game content from the Wonka website, and isn't any help in finding the game. According to an archive of Fetchfido, the game was 384 KB in size. The game content itself was not captured at its original location on the Wonka website by the Wayback Machine. The game consisted of eight jigsaw puzzles themed after different flavours of Laffy Taffy, each associated with a colour: Sour Green Apple (light green,) Strawberry (pink,) Grape (purple,) Banana (yellow,) Watermelon (green,) Blue Raspberry (blue,) Cherry (red) and Fruit Punch (light blue.) The puzzle pieces swayed around and only stood still when you put them in place and finished the puzzle. There was a time limit to completing the puzzles. The puzzles were not unlocked in order - rather, they were all accessible at the start of the game. There were lots of sound effects, and the game shared the same bright artstyle that other Wonka games on the website had - in fact, the flavours have the same character designs as in the Laffy Taffy 3D Pyramid game, which was also on the same Wonka website. The description of the game from Primary Games, via Wayback Machine, was "These aren't your ordinary puzzles...they're moving! Choose one of the 8 puzzles and then click and drag the moving puzzle piece to the right side (if you can get it!)." The Primary Games logo for the LAFFY TAFFY Puzzle Game. Displays the Cherry puzzle.